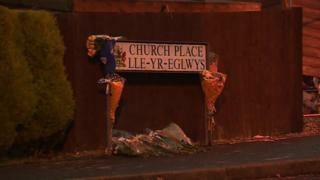 A 17-year-old man has died in a single-vehicle collision in Neath Port Talbot. The passenger of a red Mini died in the incident at 03:45 BST on Saturday at the junction of Church Road and Church Place in Seven Sisters. South Wales Police are investigating and have appealed for "anyone who may have seen the collision or who saw the vehicle being driven" before the crash. Two fire crews attended the scene and Church Road was closed in both directions while officers investigated.